These racks went up quickly and are super easy to use. 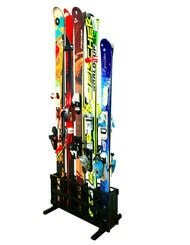 Fits all types of skis and can adjust along the rack for spacing of different bindings. Great, cost effective rack to organize your quiver. No more hauling up and down stairs. Very convenient, easy to install, not obtrusive on a sizable deck. Excellent purchase! Great rack and great packaging. The assembly went very well I had it assembled in less than 1/2. I love the simple yet versatile design. REALLY GREAT SIMPLE DESIGN! Really nice and not bad assembling, many complements from the neighbors. Looks great in our wooded location on the cape! StoreYourBoard was founded out of necessity. We had boards and gear everywhere and nowhere to put it. 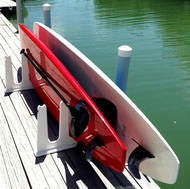 It all started with our founder creating a board rack for his wakeboards. Storage and display racks are still our speciality. 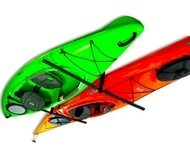 Whether it is a SUP, wakeboard, snowboard, surfboard, kayak, skateboard, skis, or bike we have the best products available and the best selection to meet all your needs. 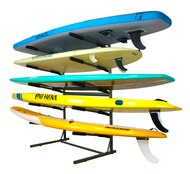 Since our founding in 2009, our customers have supported us as we continue to grow from board racks. We now carry bags and accessories for all our core sport categories. We continue to search and find the best products. These are often only available at StoreYourBoard. We strive to provide the very best online customer experience. We are always working to improve StoreYourBoard.